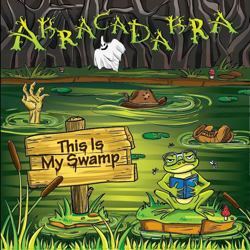 Folk dance metallers Abracadabra from St. Petersburg have recently signed to SoundAge Productions in order to release their debut full-length album, entitled “This Is My Swamp“. They decorate their fabulous and absurd imaginary places with melodic, yet brutal folk metal. There is a positive mood in their music and their stories can be fun and funny, or turn a little scary. For now Abracadabra have unveiled the cover artwork for “This Is My Swamp“, illustrated by Anitta Rozhkova, as well as the full tracklist. The album is scheduled for release in January 2015.